Another set of improved textures for FSX and P3D. Moon, roads, railways, rivers, rocks and forests in High Definition and for free! Apart from the moon, all textures that I described in this text are affected by FTX Global Base Pack. If you install FTX Global after installing these add-ons – they will be overwritten. If you install them after FTX Global – they may overwrite it’s textures that are usually better. FTX Global users should only use roads (I consider 7cm roads better than FTX roads) and moon. 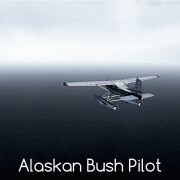 My favorite add-on from this list. 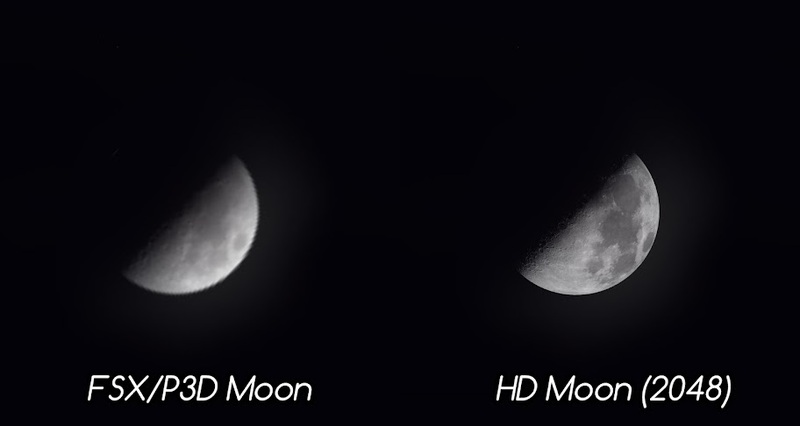 It changes default lo-res moon into something beautiful! There is a choice of 512x512px textures and 1024^2 and 2048^2. I recommend the last option. To install – extract all files, select version that suits you (512, 1024 or 2048) an copy moon bitmaps (all 15 of them) to Texture folder inside your main FSX or P3D folder. You will need to overwrite the old files. As always – I suggest you make a backup first. Each of them contains replacement taxtures in three versions – 7cm, 15cm and 30cm. 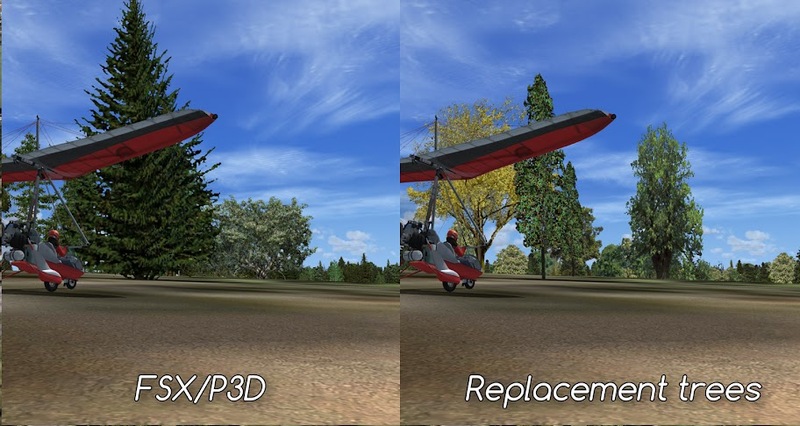 Select one that suits you and copy the scenery folder into your main FSX or P3D folder. 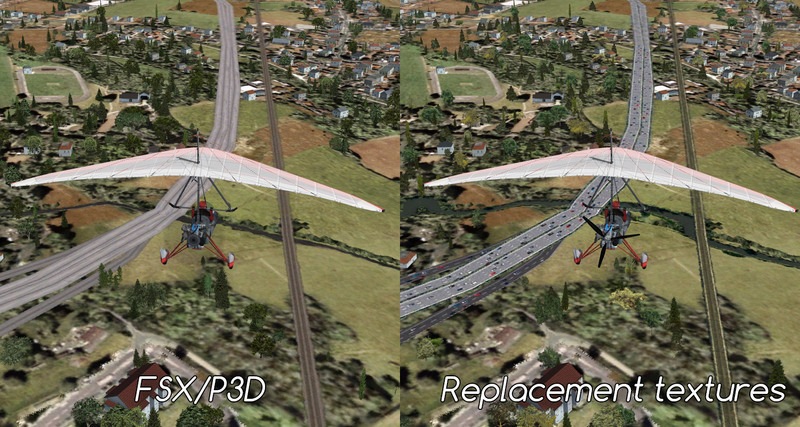 Alternatively you can copy bmp files directly to /Scenery/World/Texture inside your main FSX or P3D folder. HD Trees is an another project of Aimé Leclercq. 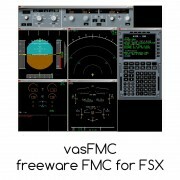 Use Flightsim.com search engine to find FSX TreeX (plik treexv21.zip). Installer app is included – it ads the textures automatically and allows for a choice between several different tree types. Another texture set by Aime Leclercq. I like the idea but I actually never used this one beside doing some tests – I do not like the contrast between hi definition forest texture and normal resolution of default textures surrounding it. Bu I suggest you try it and decide for yourself. Just remember to make a backup copy of your default textures. Remember to download all parts of each package. Then copy the scenery folder from each package to your main FSX (P3D) folder. You can also copy the bmp files directly to /scenery/world/texture.